Early in the summer, the European trade was affected by a large supply of avocados due to a large harvest in Peru and South Africa. Prices came under pressure and for the first time in years there appeared to be a surplus. Were these the first signs that the market had reached its limits? Nothing seems farther from the truth. South African exporters are very optimistic about the season. Plantings continue and the worldwide production is still on the rise. In the meantime, European traders are relieved: the market is stabilising. The European market is recovering and prices have stabilised after a period that is described as "tricky", as large volumes from both South Africa and Peru became available, putting prices under pressure. Those traders who didn't foresee the timing of the fruit's arrival suffered low prices as a result. According to large companies, the season was not bad. In certain weeks, the price was comparable to last year's, but for the Fuerte the market was pretty depressed at certain times. Exporters have reduced their volume over the past few weeks, but now large volumes are again available for export. In Russia and the Middle East, the prices made are comparable to those reached in Europe. Also, these countries are a good market for greenskins. Exports will stop from the end of October. On the local market, prices are at the lowest level in five years, to the delight of consumers. The revenue for the growers is comparable with last year's, despite the larger volumes. In the north of the country, some trees have already been in bloom, so the prospects for the next season are good. in KwaZulu-Natal, the harvest is still in full swing, just like the new plantings in the southern Cape region. The goal of a year-round domestic supply has almost been achieved. The season starts in March in Mozambique and ends in January in the Cape region and the higher areas in Limpopo. A lot is planted in the region. Zambia and Zimbabwe are expanding the acreage, although the long distance to the ports still plays a role in these areas. In the first half of this year, Mexico managed to export a larger volume to China than in 2017. Between January and June of this year, the country shipped 9,368 tonnes to China. That is 7.1% more than in the twelve months of 2017. The demand in China has increased and the price for Mexican growers has remained stable at 24 to 32 pesos. Moreover, production increased by 6% to 997,000 tonnes in 2017. "That makes it possible to have enough avocados to supply both the export and the domestic markets," according to a trader. Consumption is growing in China. The Chinese consumer associates avocados with Mexico. Thanks in part to new protocols that made exports from Jalisco possible since December last year, trade can develop further. Mexico's exports to China increased from 939,000 kilos to 8.74 million kilos between 2013 and 2017, which entails a huge 831% growth. The start of the new season is imminent. The summer months are traditionally quiet. "The fruit looks good, but is a bit on the small side," says a trader. The quality looks promising. The smaller size is the result of problems in the water supply. Besides China, the US is traditionally the largest buyer of avocados. Other markets are Europe and the Middle East. Last year, Peru exported $ 175.2 million worth of avocados to the US. This year, an 8% drop is expected, but for next year, the outlook is good (with a growth of 21%). The figures for 2017 showed growth compared to 2016. The 175.2 million dollar turnover was 134% greater than that of 2016. The volume stood at 66,215 tonnes; 105% more than in the previous year. "That was a recovery after two years of drops (-31% in 2015 and -10% in 2016)," said a representative of the sector. Between 2013 and 2017, Peru accounted for 7% of all US avocado imports. With this, the country ranks second in the list of largest suppliers. With 88%, Mexico has the largest share of the US market by far. The third and fourth positions on the list correspond to Chile and the Dominican Republic, which together account for 5%. In the last five years, exports to the US have shown a dynamic pattern. With the US authorities' proposal to give Ecuador access to the US, Peru may be gaining a new competitor. "Although the export from Ecuador is not an obstacle to the growth of Peruvian exports, the proposal is a warning to Peruvian exporters to stay on their toes." The path of innovation and added value to pursue a larger market share has to be followed, according to a representative of the sector. Ecuador: Avocados to the US? The Netherlands, Spain and Hong Kong were the most important markets in 2017. Soon the country hopes to gain access to the US market. That process is in full swing, but no deadline has been set. The acreage in Ecuador stands at 680 hectares, which yield 400 tonnes of production per year. After coffee, bananas, flowers, palm oil and sugar, Hass avocados are the "green gold" for the Colombian economy. It is expected that 33,000 tonnes worth 70 million dollars will be brought to the market this year. According to a trader, this rapid growth is due to the good quality of the product. In 2010, the value of exports amounted to 107,000 dollars; in 2016, that figure had risen to 35 million dollars. The Netherlands, the United Kingdom and Spain are the most important destinations. In the framework of their bilateral relations, the Taiwanese authorities have told the Honduran Government which conditions must be met in order to attract investors from Taiwan. There are currently a number of projects in the agricultural sector in which Taiwanese investors are participating. One is an avocado seed project. In view of the growing production and demand for avocados, investors are prepared to invest money in the crop's cultivation in order for the avocados to be exported to Taiwan. The season in Mexico is switching, so the so-called "loca" (also known as "off bloom") avocados are hitting the US market. This season lasts until about mid-September, after which the 2019 season kicks off, says a trader. The harvest for the US market comes from Michoacán, Mexico. That is currently the only region with permission to export to the US, but there are more growing areas. For example, Canada also imports from Jalisco. Although the fruit currently has a good shelf life of one to two weeks, the supply is limited. With the new harvest, an importer expects a sufficient supply with good prices. Besides Californian avocados, the Mexican ones are loved by Americans. "Californian avocados are always the first choice, because consumers want a domestic product," says a trader. These avocados also yield 2 to 3 dollars more. "Next in the list of preferences are Mexican and Peruvian avocados, and Mexican avocados do better, because the taste is superior." As the supply of the new harvest starts to rise, the prices are expected to fall. On average, organic avocados yield 2 to 3 dollars more and are usually more sustainable if the quality is good. "There is always a consumer demand for organic," says a trader. The season in Malaga came to a close a few months ago, but there are still some late varieties such as the Lamb Hass and the Reed in the market. However, the bulk of the supply consists of imports. Most growers in Malaga opt for the Hass variety, but the season could be extended with a diversification of varieties. With proper selection, year-round production should be possible. The market is recovering after a difficult period in the beginning of the summer. This year, the Spanish harvest will be bigger. "It has been stressful for all of us; Europe was not able to absorb such a large volume in such a short time," says a trader. Some have compared the situation with the "avocado crisis" of 2007, but the consumption figures were then much lower. The market is recovering and Colombia and Mexico are starting the harvest. There may be a small gap between these seasons and the Spanish harvest. More avocados are expected to be harvested in Malaga and Morocco. The season starts in September with the Bacon and continues with the Hass and Fuerte in November. 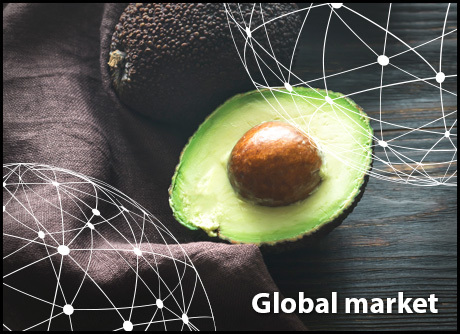 Despite the unprecedented growth of the avocado market, this summer the supply on the European market was just too big. A dramatic price level of 3-4 Euro was the result. In the meantime, the market has picked up again and the sector is preparing for shortages in September. According to importers, the supply was not 30% higher, as experts expected, but 70% greater. All countries had an on-year and that resulted in this gigantic oversupply, which no one had predicted. The export from Peru started later, which meant that the containers concentrated in a lower number of weeks. The market conditions have now gone back to normal. The avocado trade seems to be stabilising again after an eventful period, say the importers. The Peruvian season is in the final stage and Chile is expected to start exporting from week 36 onwards. After a period with very low prices, the market is now catching up again. It is therefore expected that the prices will continue to rise slightly until the start of the Chilean season. Since Chile uses the US market as a reference, they also demand higher prices for their product, say the traders. Furthermore, the availability of small calibres (24+) is not too great. This too has an impact on the price. The quality of South African and Peruvian avocados is very satisfying. As far as sales are concerned, traders don't really have much reason to complain. Normally, the popularity of avocados decreases somewhat during the summer due to the competition from stone fruit and other summer products. That has not been the case this season, especially because the consumption of avocados in general is still increasing. In the 2016-2017 season, sales grew by about 31 percent. The experts believe in the product's potential for further development. For the past 2 to 3 weeks, the French avocado market has been doing well, says a large importer who mainly offers Peruvian products. "Volumes are decreasing while the demand continues to grow." The rising demand is mainly a result of the fact that most consumers are back from their holidays. The prices also rise with the higher demand. "The current price of a box of size 12 avocados is € 7- € 8; one of size 14 costs € 8- € 9, one of size 16 reaches € 9- € 9.50 and sizes 18, 20, 22 and 24 cost around € 10. At the moment, Peru mainly supplies large sizes (12, 14). The supply of small and medium sizes (16, 18 and 20) is small, and these are precisely the sizes that are being demanded by supermarkets, so the volumes that arrive are sold very quickly." "If nothing unexpected happens, the market will only pick up further in September and October, until Chilean, Spanish and Israeli products eventually come on the market." At the moment, there are mainly Peruvian and South African avocados on the market in France. Traditionally no exotics are cultivated in the country, but that is now changing. Thanks to the knowledge that experts gained abroad and the curiosity of Italian growers, a niche will arise in the coming years. Due to climate change, the weather in the south of "the boot" has become suitable for the cultivation of exotic crops. The country currently has 260 hectares devoted to avocado plantations, 200 of which are in Sicily. The domestic production is not expected to make imports unnecessary. Growers are increasingly interested in the cultivation of avocados and mangoes. In Sicily, the harvest starts at the end of September/beginning of October with the Zutano avocado. It continues later with the Bacon, Fuerte and Hass. The season comes to a close with the Reed. The avocados are brought on the domestic market, but there is also export to France and Portugal, among other destinations. The outlook is positive. In Italy, avocados are not yet on the daily menu, but traders still see room for growth in the market thanks to current health trends. Consumption grew from 3,600 tonnes in 2007 to more than 13,000 tonnes in 2016 (+261 percent). In the last three years, the market has recorded amazing growth figures. The vast majority of avocados are currently harvested in the central coastal areas in the east. Central Queensland accounts for 50% of the supply and in central New South Wales the harvest is also well underway, with a 19% share of the supply. Sunshine Coast (12%) and South Queensland (11%) complete the top four. There is still a limited supply from North Queensland, as well as some small volumes from Tamborine/Northern Rivers and Tristate. Between 250,000 and 360,000 trays have been placed weekly on the market up until the end of July; this comes close to the prospects for the season. The volume is considerably higher than in the same period a year earlier. That is the result of a good season with a high yield and the entry into production of new plantings. The quality is good and the sizes are great. The sector has drawn up a multi-year plan to get ready-to-eat avocados on the shelves in Malaysia and Singapore. One of the challenges is the reticence of retailers to offer ripened fruit. Other destinations, such as Thailand, are also being looked into. The export protocols for New Zealand are very strict, but some exporters manage to ship avocados to that market. The avocado market in China is growing and there is still plenty of room for new investors. Most of the avocados are imported from Latin America, but there is also supply from New Zealand and Spain. Avocados are still relatively unknown in China, but thanks to promotional campaigns, the popularity is growing. The price of the fruit remains stable, although there are differences depending on the country of origin. Mexican avocados are slightly more expensive than those supplied by Chile. This also has to do with the higher import fee applied on Mexican avocados. Chile, by contrast, has a trade agreement with China that has brought tariffs down. The Chinese have used the quality requirements for import established by the US as a reference to formulate their own requirements. As a result, there is only room for high quality avocados. The storage facilities in China have room for improvement. Sometimes, the avocados ripen too quickly because the storage conditions are not good. Large importers are investing in improvements for their storage facilities.